We hear about the issue when people fly drunk, but this is something differant. Birds that were thought to have died from avian flu in Romania instead apparently drank themselves to death. 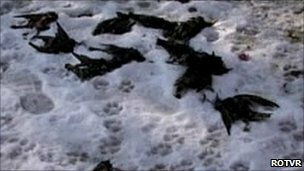 Residents of Constanta in eastern Romania found dozens of dead starlings on the outskirts of the city on Saturday. They alerted authorities, fearing the birds had died from avian flu. But local veterinary officials decided the starlings had died after eating grape 'marc' - the leftovers from the wine-making process. The head of the local sanitary and veterinary authority, Dvsva, told news agency Agerpres that analysis of the starlings' gizzards showed they had died from alcohol poisoning. There have been a number of unexplained mass bird deaths recently in several countries, including the United States and Sweden. Fireworks were blamed for the deaths of thousands of red-winged blackbirds in Arkansas, while in Sweden officials believe almost 100 jackdaws found dead in the centre of a town had simply been run over. Oh my so they drank themselves to death? Well it can happen in adults, I guess it could happen to birds but poor birdies! I guess we're not that different from each other! How strange. So, were these wine remnants wrongly disposed of? Oh wow! I have heard of birds eating rice and blowing up, but this is a new one to me, lol. Poor birds. How strange, but funny about the birds. Where do you come up with all these interesting stories.